The history of the Holywell Band is somewhat sketchy, although there are references made about the Band within local historic records dating back to 1887 and evidence that the Band was placed first in a contest of four bands in 1895 conducted by D. Owens and playing ‘Trafalgar’. During the 19th century Holywell and the Greenfield Valley was famous for its industry and textile mills. 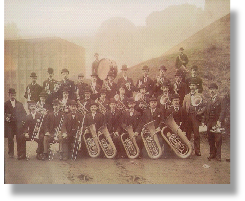 There is evidence of three brass bands based in Holywell during the later half of the 19th century, the Holywell Textile Mills Band, the Holywell Colliery Band and the Holywell Volunteers Band. The origins of the present day Holywell Band is thought to stem from the Holywell Textile Mills Band. This Band later changed its name to Holywell Flannel Mills Band, which is known to have played during the assembling of the local detachment of troops in 1914 at Flint Castle. “The first to arrive at Flint castle were the Hawarden and Caegwrle detachments, followed by Connah’s Quay, Shotton, Queensferry, Buckley & Mold, all arriving by train. Then at about seven in the evening, distant music was to be heard signalling the arrival of the Holywell Pals Contingent. They had marched all the way from Holywell some 5 miles led by the Holywell Mills Band, who on their way had been joined by the Bagillt Prize Band and a large crowd of children and well wishers”. With the demise of the ‘Flannel Mills’ around 1926 its brass players formed the nucleus of the Holywell Band. The Band continued playing and entertaining the public in the area for 25 years and in 1951 the Band folded. Many joined other local bands such as Gwesper, Flint, Connah’s Quay, John Summers Steel Works and Northop, only the latter of these bands exist today. The band was reformed after a public meeting in 1971 with some of the ex-bandsmen returning to form the nucleus of the Holywell Band. The Band enjoyed some success during the late 1970’s and early 1980’s and in 1984 was promoted to the third section where they continued with their success for under the baton of Denzil Stephens. In the early nineties the band lost many of its experienced players to local championship section bands and the demise of brass tuition in local schools found the band was unable to recruit new players and so it could not maintain its status and commitments. In 1998 a meeting was arranged between many ex-players and the Town Council with the aim to reform the Holywell Band. With the aid of a grant from the Town Council the instruments, uniforms and music were retrieved and the band was reformed. Starting with ten members a media campaign set out to seek new members . The band grew from strength to strength both in members and friends, under the guidance of local musical directors, David Roberts, Trevor Sutherland and John Pemberton. Under the baton of David Davies the band returned to the contest stage and achieved successes, winning the Rhyl ‘Festival of Brass’ (2004 & 5) and gaining promotion to the Third Section (2006). However the Band, attained its greatest contesting position, to date, under the direction of retuning Musical Director Gareth Thomas, having previously taken the Band in the early 1980’s, the Band gained promotion to the Second Section in 2006 and won the ‘Brass at the Guild’ (Preston) Contest 2006.